SSDs are seeing diminishing returns as Moore's law ends and quantum effects set in. Multilayers and more bits per cell are temporary fixes, but both have drawbacks. Moore's law has held steady over the last 50 years, but pundits believe that transistors are reaching their minimum practical size and progress can't continue at the same rate. Many experts have predicted the end of Moore's law, but so far, manufacturers have found ways to continue to eke out performance increases. The end of Moore's law is often mentioned when discussing CPUs and other electronic devices. Moore's law -- first stated by Intel co-founder Gordon Moore in 1965 -- states that, every 12 to 24 months, CPUs will double in the number of transistors and thus in performance. It has since been extended to other technologies. On the storage side, hard disks have gone through similar innovations to deliver better storage density without increasing disk size, including perpendicular recording and other methods of squeezing more bits onto a disk and fitting more disks into the same size case. SSDs that use flash memory are reaching the end of Moore's law and seeing diminishing returns. 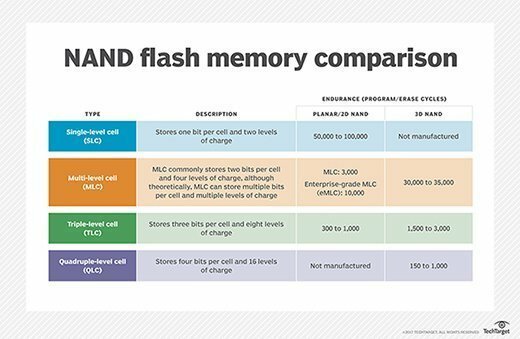 SSDs that use flash memory, however, are reaching the end of Moore's law and seeing diminishing returns. When the etching process moved below 25 nanometers (nm), quantum effects began to cause more errors. This required more error correction code, which needed more processing power in the controller, producing lower speeds and higher costs. Manufacturers solved this issue temporarily by going to multilayer flash, which went back to a 25 nm process, using multiple layers instead of the initial single layer. With layers going from 24 to 48 to 56 and even 96, capacities have seen rapid growth of nearly a hundred times in a few years. But unless the original problem of quantum effects is solved, this, too, has a point of diminishing returns -- 256 layers might be practical, but eventually, heat dissipation and other issues will curtail the growth in height. Another attempt to address the issue is to increase the number of bits per cell. The original flash cell stored one bit and was called a single-level cell. The next had two bits per cell and was called a multi-level cell. The next stored three bits per cell and was called a triple-level cell, and a recent development is the quad-level cell, which stores four bits per cell. The advantage of increasing the number of bits per cell is that it produces a large increase in capacity. The downside is it increases complexity and decreases the life span of each cell in erase cycles. One advantage of SSDs over hard drives in the search for more capacity is that SSDs, like CPUs, are subject to Moore's law. HDDs, on the other hand, are mechanical devices that have mechanical limits, as well as limits on the ultimate density of the spots that record each bit on the disk. The size of the read/write heads, the limit on the smallest movement the heads can make, the accuracy of the number of revolutions per minute that the disk spins at and many other factors affect the theoretical maximum capacity of a hard drive. One indicator of this is simple to understand: From 2007 to 2017, HDDs increased in capacity from 1 TB to 12 TB, whereas SSDs went from 64 GB to 64 TB. It's hard to say what the future holds. Pundits have been predicting the end of Moore's law, while engineers and scientists continue to find ways to keep it in effect. Perhaps someone will discover a way to use electron shells to record multiple bits per atom or a way to ameliorate quantum effects. Scientists are working with DNA, which could theoretically store 215 petabytes per gram, although access speeds and reliability still need to increase drastically to make this method suitable for data centers. In terms of SSD performance, how is your organization feeling the effects of Moore's law ending?